This weekend, we attended the Balloon Fiesta in Albuquerque, New Mexico. We dropped by twice, once on Saturday night to see the "glow" and again on Sunday morning to see the final mass launch. 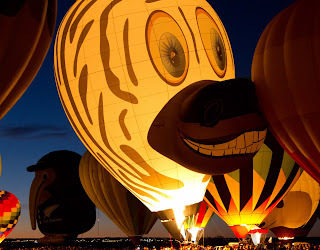 During the glow, they inflate the balloons fire them up simultaneously several times over the course of an hour or so. On Sunday morning at about 7am, over the course of about an hour or so, they launched about 300 baloons. Quite an array of balloons. Most of them the standard shape you see in the above photo. There were some very impressive shapes like Darth Vadar heads, stage coaches, and bumble bees. The place was pretty crowded. We were seriously afraid we wouldn't be able to park but both times we arrived, we sat in a queue for maybe a half hour but eventually arrived at a parking spot very close to the entrance. Parking was $10. Entrance was $6 for adults, free for kids 12 and under. So both days cost us $22 each day. The pilots get a pretty good deal. 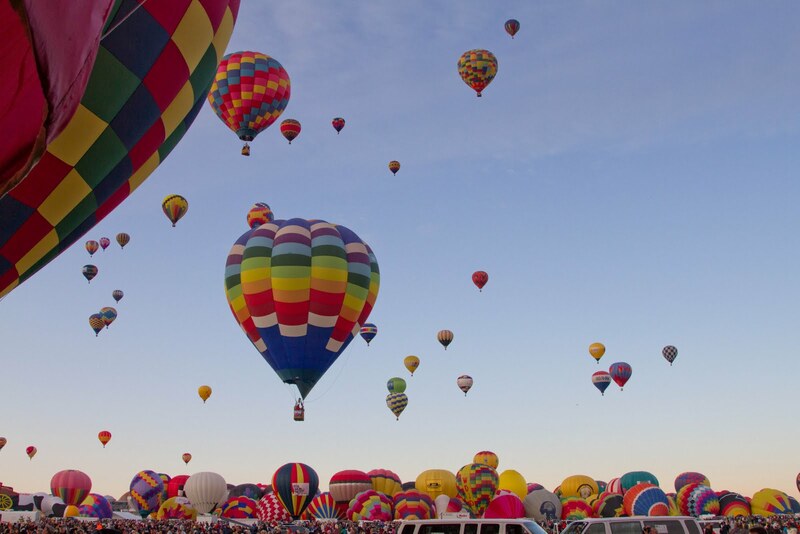 I understood the Fiesta charges them $150 to enter and for that, they give them all the gas they need to fly which is like $100 per flight and they fly maybe 10 times! Antonia and I really wanted to try and see if someone would take us up but the way it works is you really need to work on one of their ground crews, sometimes several years in a row to get that chance. We could have bought a ride but I wasn't about to lay out $1,200 for the 3 of us!